The Blogging Cow to the left was rustled from Chick-Fil-a, a popular fast food restaurant that specializes in serving chicken in stores generally placed in malls and shopping centers located in upscale neighborhoods. Rustling the cow out of the mall was easy, all I had to do was promise her warm hand jobs and no more cold electronic milking machines, and she followed me right on the truck. The hard part was teaching her to repaint the sign. I hear they still hang rustlers in some states so I'm forced to lay low. 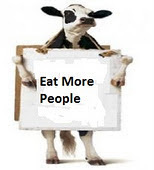 And remember, like the cow says, "Eat more people."